I’ve bought BMP085 barometric pressure sensor and my goal was to get pressure and temperature data via I2C interface to my Cubieboard running linux (cubieboard2-lubuntu-installation). It only requires two shared lines: SCL for the clock signal, and SDA for the bi-direction data transfers. Each I2C device uses a unique 7-bit address, meaning you can have more than 120 unique I2C devices sharing the bus, and you can freely communicate with them one at a time on an as-needed basis. 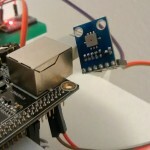 This sensor is very cheap and you can buy it for les then 5€ from ebay. I found very usefull guide for raspberry pi from adafruit. I have changed the needed files from the adafruit git and you can download modified files to work with cubieboard. By diving into arduino BMP085 libs I found the calculation, how to use the real altitude to recalculate atmospheric mean see level pressure and translate it from C to python to get the requested result that I named AltPressure. This calculation was not in adafruit sources for raspberry. AltPressure is the pressure adjusted by knowing the real altitude. In my case it’s 150m. Pleass change the value according to your altitude if you want to use the BMP085 for weather atmospheric pressure. Change the altitude in barometer.py file according to your current altitude. I configured crontab to store weather atmospheric pressure value very hour and used apache with php to depicted values in chart. Hi! I just try to compile py files and receive a lot of errors.